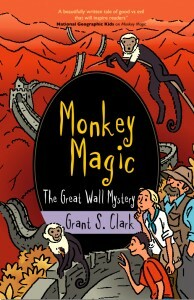 The mysterious appearance of a group of monkeys at the Great Wall of China has scientists baffled. These monkeys are not native to China, so where did they come from? And why are they there? Monkey Magic worked before for 11-year old Romy, allowing her to communicate with orangutans in The Curse of Mukada. Now she uses it to discover the monkeys’ story, but what they tell her isn’t pleasant. She will need all her wits to help them, while also keeping herself out of danger. Her new friend, Pei, shares part of her adventure, as well as some intercultural humor. And when she learns of the possibility of using Monkey Magic whenever she wants, Romy is determined to know more. Monkey Magic: The Great Wall Mystery shows us how human greed hurts wild animals, and why we need to take immediate action to try to protect them. I highly recommend this delightful, magical tale with a great environmental message.